Create squiggle writing loops and endless "Squiggle Art". 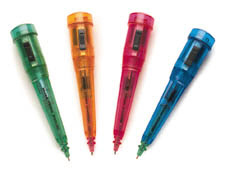 The pen has a triangular grip and contains replaceable colour points. Great motivator for reluctant writers! Super way to increase awareness of hands and warm them up in preparation for printing/writing activities. Vibration can also be used on face with nibs removed. Three nibs included. Ages 4 years and older.